Newcastle United's winless start might have stretched to eight games - but some comfort can be taken from Saturday's late 3-2 defeat at Old Trafford. At half-time, Rafa Benitez's looked set to secure only their second victory at the Theatre of Dreams since 1972 following goals from Kenedy and Yoshinori Muto. In fact, the Magpies were just 20 minutes away until Juan Mata's free-kick triggered a comeback to ease the pressure on under-fire Red Devils boss Jose Mourinho. Anthony Martial levelled to set up a tense finish before substitute Alexis Sanchez inflicted a cruel defeat in front of the 3,000-strong travelling supporters. 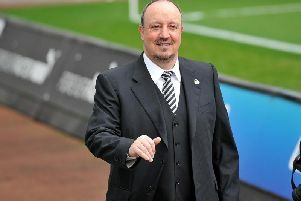 However, while Newcastle's terrible run at Manchester United continued, which extended the club's wait for a first win of the campaign, Benitez's men did become record breakers on Saturday evening. Seven minutes in, Kenedy latched onto an Ayoze Perez through ball before shifting the ball onto his favoured left side and curling the ball past David De Gea into the far corner. Newcastle's second then arrived three minutes later with Muto sending the travelling support in ecstasy on his first league start. But agonisingly, Benitez's side couldn't hold on and will now have to wait nearly two weeks before they return to action against Brighton and Hove Albion due to international break.